Even in the desert of Kuwait, things can still grow, without water but a lot of creativity. Tamara Qaddoumi is one good example: a hybrid flower of half Lebanese-Scottish and half Palestinian descent, rooted in the sand with the head in the clouds. 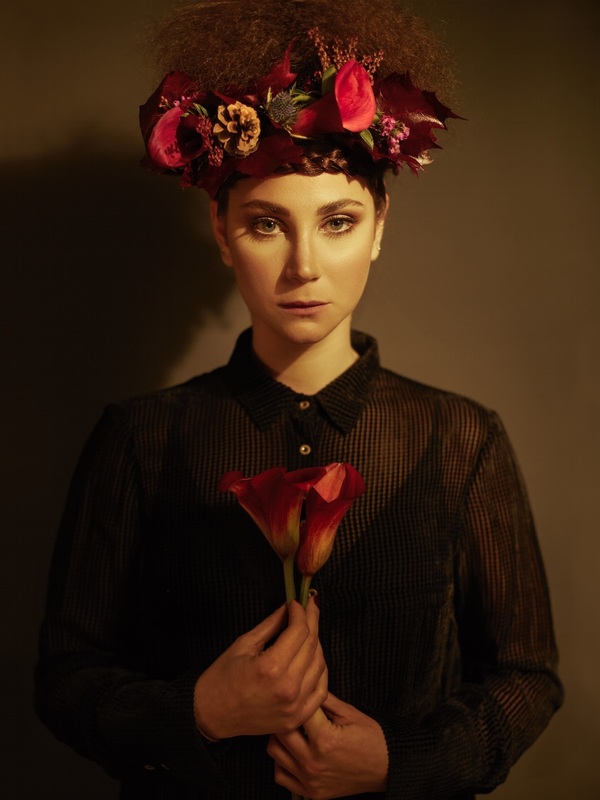 Like the bird in the video clip of her first EP Flowers will rot, released last month, she flies freely between territories and artistic disciplines. After ice-skating in the desert, playing the comedy in a drama school of England, she is now doing her musical baptism with Dust Bathing, a poetic and metaphoric prompting to embrace life. Born in Paris, raised in Kuwait by foreign parents, you also studied in London and US. What did you learn from this cosmopolitan upbringing? As a child, I went through a bit of an identity crisis because I was trying to assemble different parts of the world. But then, when I matured enough, everything got linked together naturally. I have finally found my middle ground, and music had a big part in helping me to find that steadiness. What was your childhood like in Kuwait? I always preferred colder climate and I used to spend all my time on the ice rink, which was kind of beautifully haunting because the ice rink was used to store the bodies during the Gulf war. I started to ice skate at 4 and to train extensively with a private coach. There was no figure skating at that time and I quickly started to represent my country in regional competition. I was invited to junior Olympics in China at the age of 14 but my mother thought, if I go and take part I would have to move out of Kuwait for good, and life of an athlete wasn’t something she wanted for me. That was a very difficult period in my life where I felt that a part of me was died. Why did you choose to do art? Art to me is a matter of emotional survival, the only way I can express myself. It gives me room to explore vulnerability which is usually seen as weakness, but it is such a strength when you’re given the room and space to embrace it. To me, it’s all about pushing boundaries to stop the world from falling asleep. How your country influenced your art? Kuwait is a very sleepy country and it was sometimes frustrating as a thirsty teenager. I found myself always hunting for inspirational. Running on empty created an emotional gap and it sort of fuelled a feeling of “resentment” when I was younger. As I grew, my music stemmed from that teenage negative feeling and gave me completely new eyes on how I see and appreciate Kuwait more than ever. A lot has changed over time and there is so much more food for thought now. Is it not difficult to be a female artist in Kuwait? Now there are a lot of changes going on. With the wide expanding platform social media has offered us, this I believe has given people more freedom of expression. Music is a very small industry here but we now have a lot more local talent emerging because we have more places to showcase the beautiful work. I could play on the role of being an emerging female artist from my country who is joining a strong pool of worldly woman that I believe are indeed pushing boundaries in the art & music industry but I prefer not to play in the favor of gender. Your music is very poetic and nostalgic. What is the story of Dust bathing? When I was a child, I remember that I once saw a bird taking its bath in the sand. This to me was metaphor of life: you have to constantly adjust to survive. You make do with what you have and Dust bathing, is what I have here in Kuwait. I am blessed and grateful for the stability it’s brought me in every way. It’s nurtured me differently. I don’t believe people get stuck in a certain place because of their surrounding. It is a matter of being in tune with your environment. My music is about embracing that. What do you like in Kuwait? The desert. When I was younger, I used to find it very flat and it was so hard looking ahead with nothing looking back at you. But later on, I realized that is what makes it so beautiful. You see nothingness all around you in our vast desert. And it almost gives you the impression that you’re walking on the moon. But then you explore different ends and you find some greenery, gorgeous full palm trees & other species still managing to stem and grow despite the roaring heat. How did you work on your first EP Flowers will rot? I had the chance of working with the most wonderful team Pamela Farhat & Michel Doumit who run Tic Motion Studio: a motion design and animation studio in Beirut who brought Flowers to Rot to life! Bringing in Pablo Lozano to direct, the only thing I can say that it is such a privilege, truly a privilege, to meet people who speak your language effortlessly. To work with talented, wordly people who believe in the work and poured their heart and souls into the work. I think that shows in each second of the piece. I love cirque invisible, brilliant circus exploring all end of physical theatre. Poetic bodies in motion run by James Thieree (Charlie Chaplin’s grandson) and his mother Victoria Chaplin. To me, music should be able to activate all your senses. And accomplishing such fluidity is a masterpiece! What do you call home today? Home for me isn’t a physical place. It is more about people.